While I love onion soup, I have never been a fan of the huge stringy cheese and bread glob which you typically find floating on top of the soup. The bread becomes a soggy mess and the melted cheese is stringy and hard to swallow! This top layer of cheese glob also creates an insulating effect, so as a result the soup is always molten hot and I inevitably burn my mouth! In response to this I decided to puree my onion soup creating an almost creamy texture and also create Gruyere toasts which can be served on the side so they are nice and crispy. 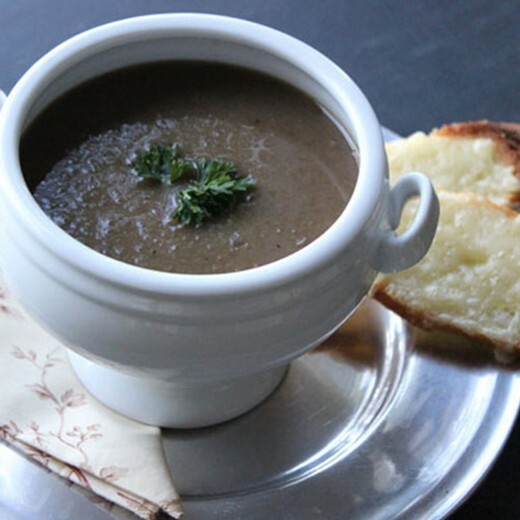 This deliciously rich fall flavored soup also uses 4 different onions (Red, White, Sweet and Garlic) as well as a generous splash of our Cab/Merlot to create an intensely complex deep onion flavor. 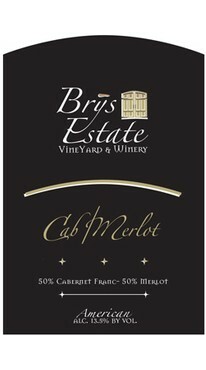 Grab a glass of our Cab/Merlot and try this new take on an old classic! In a large soup pot over medium low heat add the butter and olive oil. Once the butter has melted, add the onions, garlic, bay leaves and thyme. Saute uncovered stirring every few minutes until the onions have softened and browned - about 25 minutes. Raise heat to medium and add wine. Continue to simmer until the wine has almost evaporated, about 5 minutes. Add the flour and continue to cook for a couple minutes to cook out the raw flour taste. Add the beef broth and stir. Bring to a simmer, then reduce heat to low. Allow the soup to cook uncovered for an additional 20-30 minutes to allow the flavors to combine. Puree the soup using an immersion blender (one of my favorite kitchen gadgets) or transfer to a blender and puree until smooth. Add 3-4 tsp salt (this amount can vary depending on the beef broth you purchase - start with 2 tsp, taste then add more to taste) and 1/2 tsp fresh ground black pepper. Stir to combine. Set your oven to broil. Cut the baguette on a diagonal in 1/4 inch thick slices. Place the baguette slices on a sheet tray, brush with olive oil on one side and sprinkle with salt. Place in the oven and broil for a couple minutes until the top of the toasts turns light brown. Remove from the oven and flip the toasts over. Sprinkle the toasts generously with grated Gruyere cheese. Put the toasts back in the oven and broil for a couple minutes until the toast's cheese is melted and starting to turn golden brown. Serve soup in bowls with the toasts on the side. Garnish with fresh parsley.